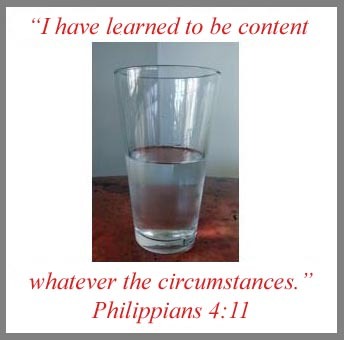 Contentment – is it elusive? Sometimes I think that the minute I experience the breathtaking view of contentment in one area of my life I take a step backward and fall off a cliff into the pit of discontent in another. Focusing on contentment this summer causes me to look honestly at what resides in my heart and who sits on its throne. What about you, is discontent at home in your heart? The first tool to help us as we learn contentment is a magnifying glass – one that looks at the heart for signs of discontent. What are the signs/symptoms of discontent? (First, let me say this is not a diagnostic list, rather it is an experiential one.) I know I am discontent when I am angry, frustrated, feel like no one understands me, prideful, envious, jealous, a bit depressed, unthankful, disjointed, sour, antsy, or just plain old grumpy and complaining. The list of things that might make us discontent is endless. We can experience discontent in every realm of our lives: spiritual, emotional, physical, material, financial, relationships, family, work, home, ministry, health… you name it. No one is immune from the ugliness of discontent, or the vileness it produces in our heart. Christians are unappealing and unattractive when we are discontent. Discontent closes the door to evangelism – seriously! Do you know anyone who would want to submit to God if God is as bad as we present him to be through our complaining? Our words reveal our heart. When we complain about everything God does in our lives, (which is what we do when we complain about our circumstances), we are saying that God is not the loving King who rules our hearts and lives but rather is a bad, uninformed, mean, miserly God. When we tell people they should trust him, but we don’t, when we say God is sovereign, but we complain, when we say that God is wise, but we challenge his decisions, what are we saying about God? What does this reveal about the state of our hearts? A contented heart allows us to witness to the beauty of God. Contentment reveals a wise God. Contentment shows that we have submitted to God and he sits on the throne of our hearts. Contentment is sweet. We are commanded to be content. I think we must agree that discontent is a sin, and therefore, every excuse to try to justify our discontent is like trying to put lipstick on a pig. We cannot cover our sin with excuses. We also cannot let the sin of discontentment drive us away from God. We must confess that we are sinners and repent of discontentment – that means kicking discontent out of our hearts. We learn contentment as we trust in the character of God in every area of our lives, every situation, circumstance, relationship and dilemma. For every discontent in your heart, the remedy is the character of God. God does what God does because God is the all-wise God. Discontent closes the door of our hearts to prayer, worship, praise, and thanksgiving. When we trust God’s character, we will be thankful, prayerful, and worshipful and will praise him for what he does – we will be content. When we fail to ponder, or meditate, on the character of God in our circumstances we forfeit his comfort. When we forfeit God’s comfort, we wallow in discontent. It is a never-ending cycle. We break the cycle by thinking on God. If discontent has moved into your heart then hopefully, the tools we will look at over the next few weeks will serve as an eviction notice. Next week we will continue looking at tools to help us learn contentment. If you don’t want to miss a post on contentment, and are not currently a follower of this blog, simply click “follow” at the top of the right column. As a follower, you will receive an email each time a post is published.